Let us go back for a moment to the days where glass perfume bottles spritzed the scene with a glamourous femininity. Vanity tables held your days aspirations along with a favorited palate of blushing hues. Lavish seating was dawned in pretty prints and dreamy ruffles that would inspire your vanity setting with class and style. The charms of an era past can be brought to the present with a pleasant and perfected touch. Adding a Skirted Traditional Vanity Chair to your regimen will be a lavish accessory . The days are busy and your vanity may coexist with agendas for the week. Keeping it couture will add a breath of fresh air to your morning routine. Elegant accents and eloquent decor accompany a cherished style for a melody of a graceful presence. Exquisite colors and pairings are chic and beautifully presented. We have twenty delightfully illustrated Skirted Vanity Chairs that you can either bring home or style your own. A days project will create your own personalized style with a vintage view. Sheer brilliance and illumination fill each space with a lovely vanity design. No longer exclusively limited to seating for a bedroom vanity mirror, these chairs work well as adorable desk chairs like the one featured here. Retro chic, this combination of patterns sits nicely against the wooden flooring. Contrasting patterns are a charismatic pairing with a sleek table design. Discreet and pleated, the skirt for this vanity chair complements the lighter tones that are layered tgroughout. This traditional style is well stated and cozy. A gorgeous couture vanity chair has a ball room elegance. A full skirt is chic in black and white stripes offering a delicate balance with the timeless bodice of the seat. The heart of a vintage charm is lace and pearls with a blushing pink floral bouquet. The antique ivory whispers an elegant style for your vanity. Traditional vanity stools are a classic option. Backless and ruffled, this sweet setting has a lovely pink theme that is both feminine and fashionable. An elaborate vanity view is luxuriously draped with marble and dramatic golden touches. A stated creme offers a lavish setting with a dreamy vanity design. Vintage with antique appeals is the vanity theme for this arrangement. The completing blue and creme style is fashioned with groupings of florals and accents that truly add a breathtaking vanity set. Indulging patterns and vintage hues are pleasantly ruffled in a whimsical style. The story book seating is dressed for a lovely review of the room. A collaborative use of color and statements are outgoing in an oversized vanity chair. The comfortable seating has pleats and patterns making for a promising style. Contemporary decor can benefit from a vanity stool too, placed discreetly under the vanity when not in use. The added skirt allows the neutral color to blend seamlessly into the colors on the wall and floor. The vanity chair is patterned with a fine check style that meets the paisley table skirting for a phenomenal pairing. Country tones are a soft yet brilliant style. Modernly mideviel, this trending style has a simplified skirting added to the vanity chair for a classic touch that enhances the embellished surroundings. Cute and couture, we have an elegant single ruffle that is paired with a matching accent pillow. Vintage cues are unanimously charming. This cute and clever white vanity chair is the perfect addition to the room. Marbled surfaces are glamoured with a stark white surrounding that is full of natural lighting. Vintage and rustic vanity has a distressed shabby chic style. Antique candlesticks are elegantly paired with a creatively decorated frame and design. A corner vanity is inslired with a vintage couch and beautifully colored vanity chair. The poetic luxe pattern is perfected in this thoughtful space. In tradition of a classy time, this glamoured setting has a classic style that honors a chic appeal. Rosy pink blushes the vanity with a cherishing view. Pretty in a pink and mint theme, this plush floral design is cheerfully airy and trimmed in an elegant fare. The genius use of color and charm make a stylish setting. An antique vanity is curved with a stylish splendor. 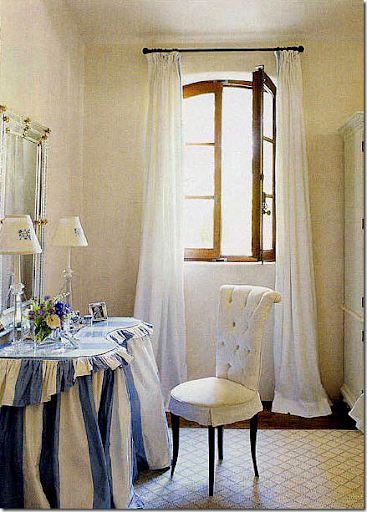 A draped skirting is distinct in texture and tone that is accented with a lush expression. Vanity Chairs that are vintage and traditional create a chic charm with a well dressed vanity chair. Ruffled with delightful patterns and textures, the illustrations above have shown a classic style that is creative and airy. The opportunity to design your own vintage vanity setting will inspire your own dreamy elegance that is sure to become a lovely part of your day. A traditional vanity chair can be restyled or purchased with a cherishing style. Beautifully lavish and simply chic impressions become an inviting design for your stylish space. The couture setting is draped with personal touches and memorable moments that lead to an exquisite addition to your homes design. Make sure you also check out our latest 20 Gothic Bedroom Design and Decor Ideas post for a different but also inspiring design.